I think I made a huge mistake. About a year ago I had taken some advice from a friend to use Zep Floor shine on the side of my RV instead of taking it to a dealer and having it waxed for $700. My 2014 Grand Design has sat outside it entire life in the Southern Utah heat and kinda started to dull. So a friend told me how to apply Zep to the side to renew it back to new. I did the entire deal. Good wash, bar keepers scrub and the whole shebang. 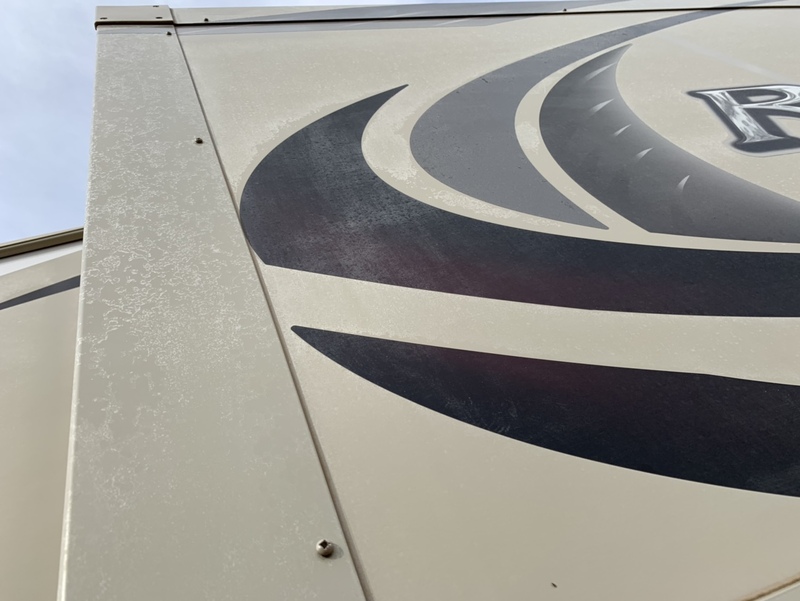 I have to admit it revitalized my trailer and made it shine for about 14-18 months or so but I haven’t been able to use it for 6 months or so and was looking at it the other day and noticed it looked like the side facing the sun the polish was dried up and flaking off. I panicked until I watched a video on YouTube with a guy using Zep Floor Stripper to remove it all. Now keep in mind only the side facing the sun and my front cap looked horrible. And even the side facing the sun where all the framing in the trailer is it still looks perfect. Thinking this may be because those parts didn’t get as hot or something but you can see where every wood stud is in the side of my trailer now. Anyways i decided since I was going to strip one side I’d strip the entire trailer. It took me about 5 hours with a scrub brush and Zep Floor polisher to try and remove the Zep Floor shine. But now it looks even worse. I have streak marks down my trailer everywhere. Yellow marks also. I went back and tried to remove the streaks down the trailer and nothing. It looks horrible. I feel like I’ve ruined my trailer. I’m tempted to try a small section and reapply the zep and see if it brings back the original shine it had a few years back when i originally put the Zep on. I figure at this point I have nothing to lose. Any ideas of what I can do? And for anyone considering doing this to their trailer I would say 100% don’t do it. Do it right and use wax or something made for fiberglass trailers. I would recommend finding a car detailer who has experience doing motorhomes. They know how to remove the old coating without hurting your clear coat. We have one near us who works for a lot of the RV repair shops in the area and only charged around $600 for a full clean and wax. We offered him cash, and he did it for $500. As I recall, our dealer wanted about $700, also. I hope you can get that stuff off and a good coat of wax on. Your pictures don't show up. There is a stripper that will take the Zep off but it may also ruin the graphics. You could try applying a very small area with another coat of Zep to see if it helps take away the streaking. I would definitely do a test area before applying a full coat though as it will be even harder to remove. I know, there are plenty who swear by the stuff but I cannot wrap my head around putting floor polish on anything but a floor. It is an INDOOR product. No UV inhibitors. Nothing to stand up to the rigours of being outside. There must be something to strip the stuff off. I am thinking along the lines of ammonia, acetone, laquer thinners, naptha? Try a small area first. Ammonia seems to be the first choice. Once the zep is gone start again, this time with a mild marine compound to get any residue off. Finish it with a good marine wax or sealant. There is no easy way. Zep seemed to be an easy way. There is short term gratification, then you pay the price. Haha. Crazy thing is his still looks great but he recoata his about every 3 months religiously. I put mine on and never reapplied anything. All I ever did was wash it. But now I’m paying the price. I wonder if I’d have kept up in it like he did if I’d be having these issues. Like I mentioned the side that doesn’t face the sun looke perfect until I put the Zep Stripper on it. Now it looks as bad as the sun side. I agree with Craig36. Take it to a professional and at least get their opinion on what is needed to restore it. Hopefully your efforts have not cut through the clear coat. Ya. Wonder if it has how you’d fix it if the clear coat is ruined. I had the same problem with my zep wax on my coach after 3 years. I tried just about everything to get it off. With no success. Then I found a you tube video on removing old zep floor wax from your rv. You put zep floor stripper in a spray bottle. Full strength. You spray the stripper onto about 2 ft square working area. Let it sit for a few seconds then rub with a moist cloth in a circle motion. You will see the wax come off. It’s comes off as a yellowish stuff. If you put 4 coats of zep floor wax it will take probably 4 Coates of stripper to remove. You will see it work when the stripper runs down onto the old wax. Then rinse with water. Keep stripping until you see the original Finnish. Your side of your trailer is not ruined with zep floor wax. The zep floor wax stripper is the only thing that removes it. The secret is to let the stripper work then you just wipe it off. Spray down with water. Have a look on the bottle of that stripper. Take a good sniff maybe. Chances are that the active ingredient is a common substance that can be had much cheaper than the brand name product. As long as I am able I'll be damned if I am going to pay some absurd price for a simple job that I can do myself. Why pay a professional price to do donkey work? Most jobs are simple when broken down into their components. After 3 yrs. , the Zep wax looks terrible on our MH. I have been using LA Awesome with a worn out scrubby pad and you can see the yellow finish run down the wall. Very labor intensive. I wish I had never applied the Zep. 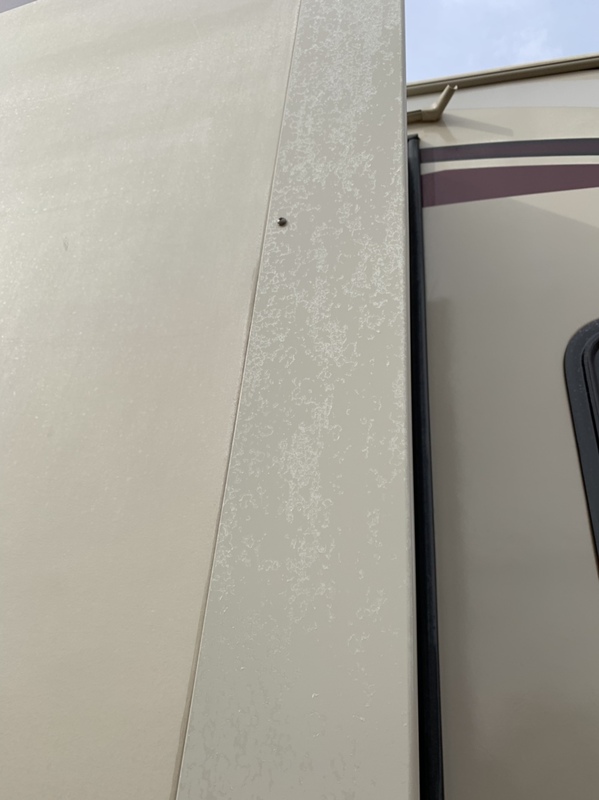 I did a few test spots over the areas that look horrible on my Rv right now. Brings back the shine to looking new. But trying to decide if this is something I want to deal with every few years or not. But those areas I did sure look good. I would not try any of the floor wax removers or any other harsh product like acetone, etc, that has been mentioned. You may have to go around a couple times with the products but they are made to remove automotive waxes and glazes, to prep your paint for a new wax coat. but before you go and do the whole thing with such a cleaner, try a little spot to see what kind of reaction (if any) you get to the floor wax. Good luck, I hope you get it looking spiffy soon.